Suspicious Heuristics: Scary statistics for the medical economics debate. Scary statistics for the medical economics debate. [The shaded box is around my response.] Survey Source. Stumbling around the internet awhile back, I came across this medical ethics questionnaire. In addition to providing a haven for procrastinators, this survey also shows the distribution of answers that others have made. Most of the questions were fairly ho-hum with predictable splits of opinion. However, the skew of answers to an economics-related question startled me. When asked "what level of involvement should the government have in setting prescription prices?" 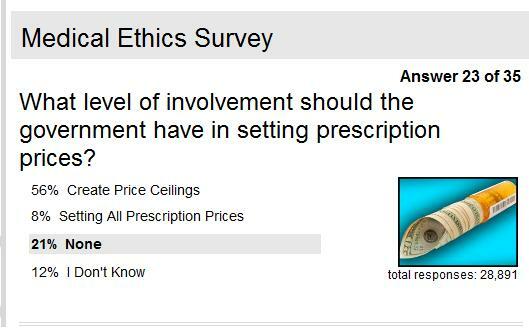 a whopping 56% of the responders said "Create Price Ceilings" and 8% more thought the government should set all prescription prices. 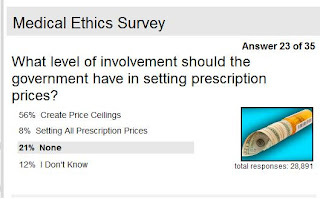 Apparently, 64% of those polled trust bureaucratic regulators more than the market when it comes to pricing medicine. I can appreciate the sentiment behind price ceilings on prescription medication: it's undeniable that many people can't afford treatment they need to stay healthy. However, price ceilings are just a bad idea. For those unfamiliar, a brief rundown on the economics of price ceilings. 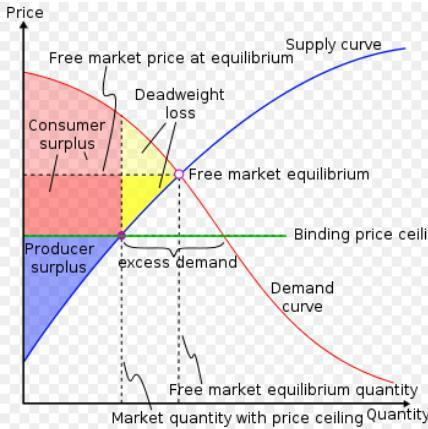 When the government mandates a below-market price for a good, it creates several negative side-effects. Most immediately, amount supplied decreases. Faced with a lower price, manufacturers will cut back on production. In context of prescription medications, this means less drugs being developed, tested and sold to the public. Ailments that could potentially be treated will continue to harm people. Slightly more subtle is dead-weight loss, which represents market transactions which could have occurred, but did not. In other words, some people could have benefited by paying the higher price to get the drug, but the price ceiling prevented them from doing so. As a result, both consumers and producers lose out, although the outcome for the person seeking medication is perhaps most tragic. High costs for prescription medications are definitely a problem; health care costs in general have been rising much faster than the general rate of inflation, putting important treatments out of reach for many people. High drug prices have also helped drive up health insurance costs, presenting a large drag on businesses. Instead of an artificial cap on prescription prices, it would be more productive to look at the supply-side factors which keep those costs high. The lengthy FDA approval process alone costs "about $800 million per approved drug" and creates instant pressure for the company to charge high prices and recoup their investment upon release. Taking aim at these restrictions would be better than capping prices and ultimately smothering the development of life-saving medications.